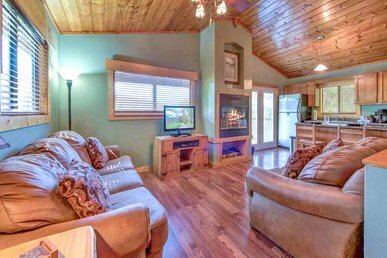 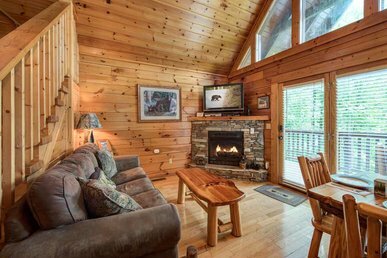 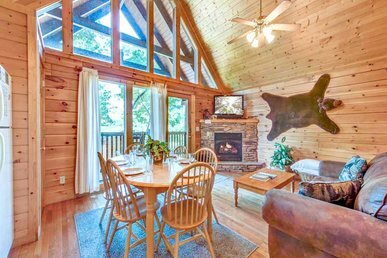 Cub’s Cove may look like your typical log cabin in the Great Smoky Mountains. 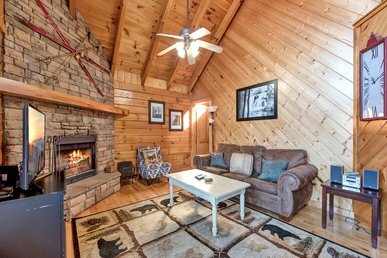 But while it offers plenty of down-home charm and cozy comfort, this 1-bedroom getaway also has more than its share of modern-day conveniences and luxuries. 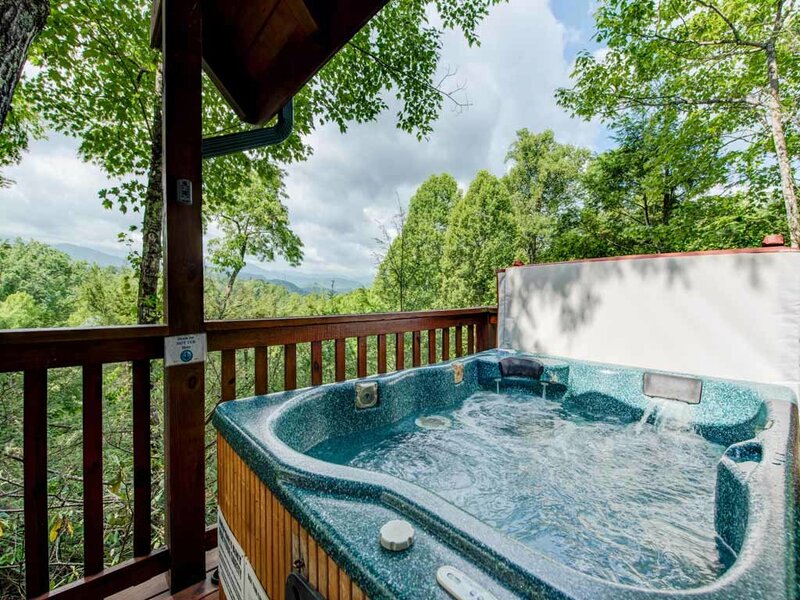 For instance, it’s a sure bet that the original mountain settlers didn’t have a spacious hot tub on their porch from which they could admire the Smokies! 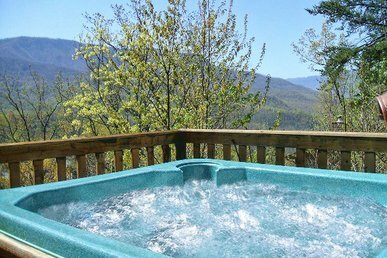 That’s right: You can start your day watching the sunrise amid the singing of the wrens and warblers as you soak among the mountain breeze. 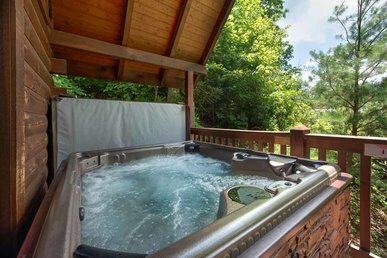 Or you can end your evening in the tub with that special someone as you gaze up among constellations you never noticed back home. 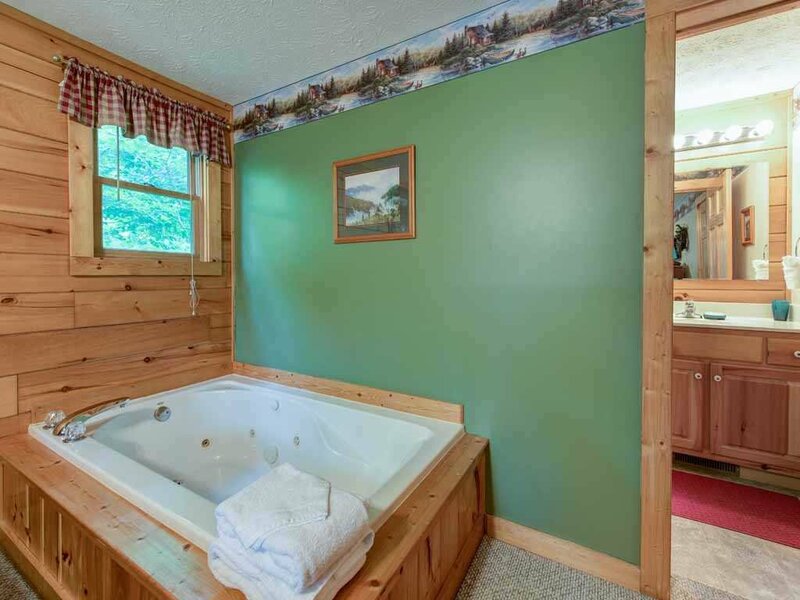 There’s a jetted tub indoors as well, part of the master suite. 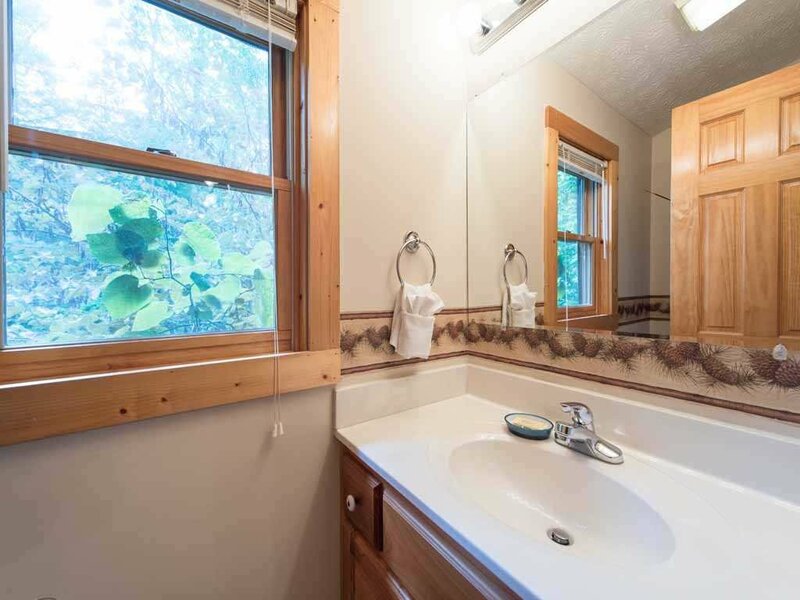 When you return to the cabin after a day of hiking, skiing, rafting, or golfing, your tired muscles will really relish a long bath among the pulsing jets. 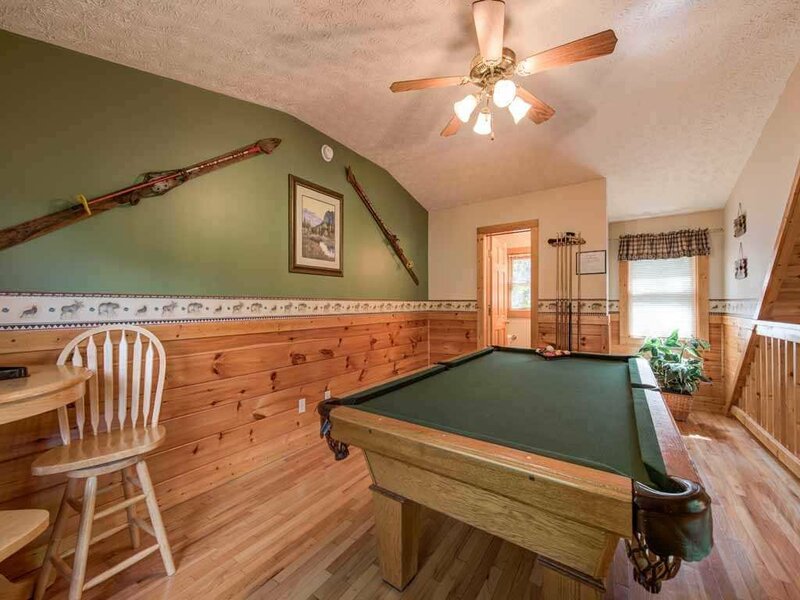 And let’s not forget about the pool table up in the loft-level game room—just the thing for a rainy day or a laid-back evening in—or the cabin’s internet access, or the satellite TV, or the DVD players… yes, it’s safe to say that the likes of Abe Lincoln wouldn’t recognize this log cabin! 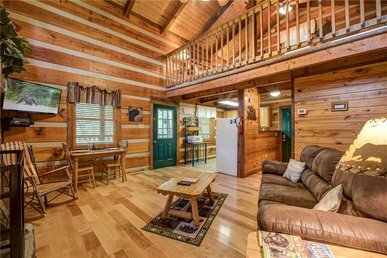 The interior is decorated in pure rustic refinement. 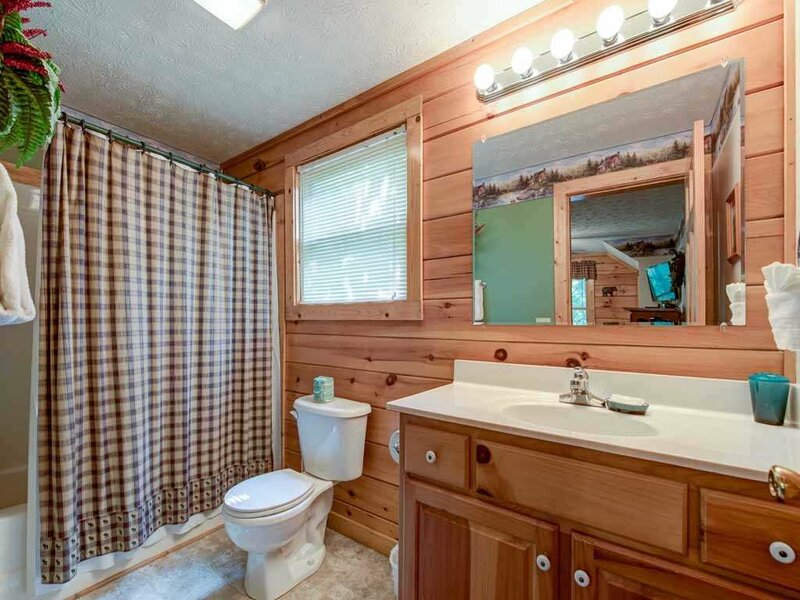 The wood floors and paneled walls perfectly complement the warm earth tones of the furnishings and accessories. 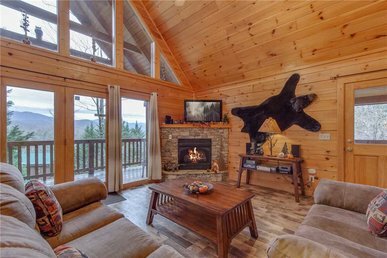 The living room sofa is wonderfully plush for snuggling in front of the gas fireplace in its stone surround or for sprawling out to watch a movie on the 50” flat-panel TV. 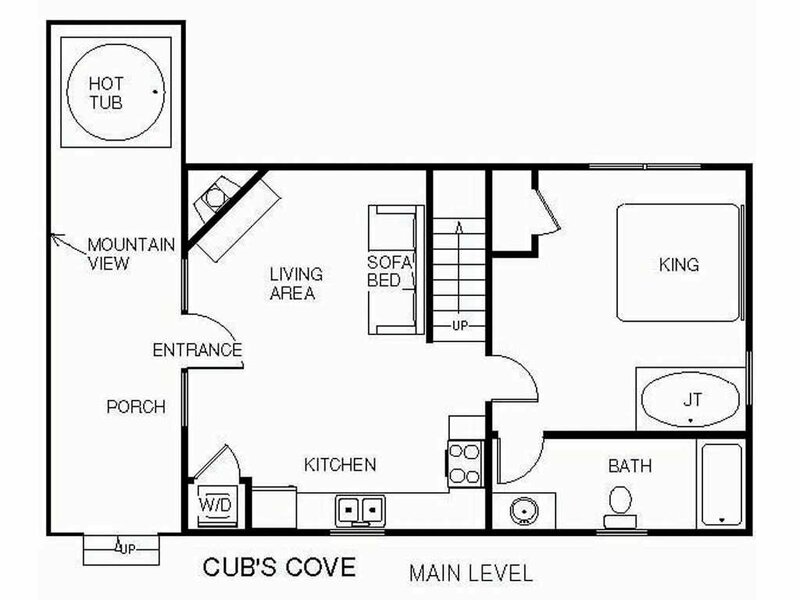 The sofa opens into a bed for 2—and quite a comfortable one at that, thanks to its deluxe memory foam mattress—so that Cub’s Cove can sleep 4 people in all. 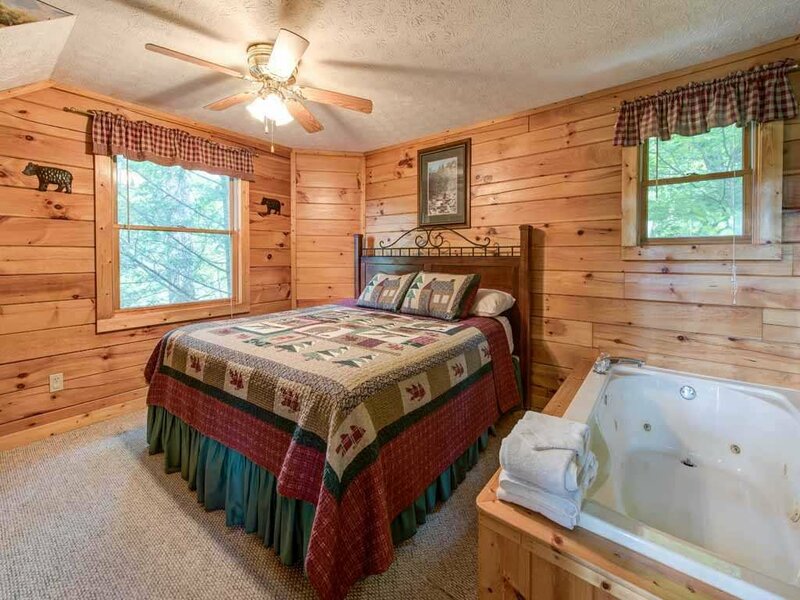 If you think the sofa bed’s comfortable, wait until you glaze atop the king-size bed in the master suite. 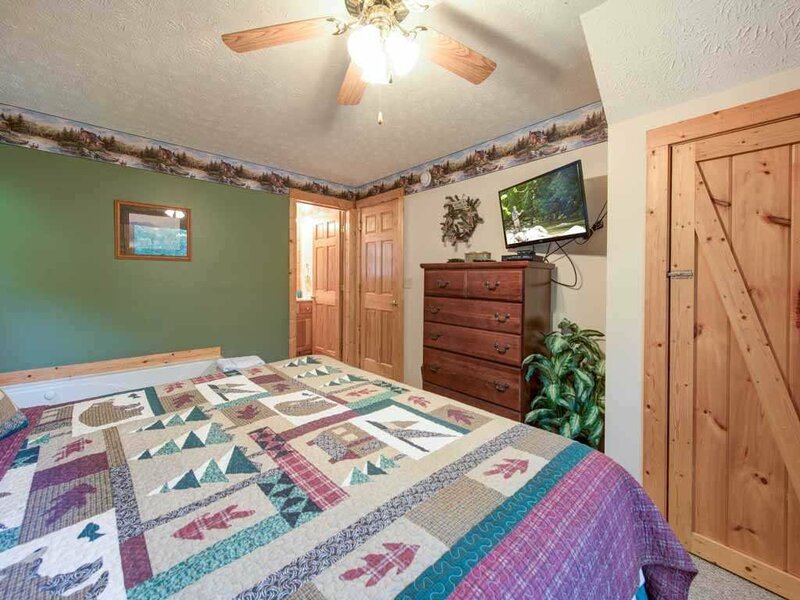 It's Simmons Beautyrest Plush Foam mattress may just give you the best sleep of your life; it’s also perfect for stretching out and watching the 31” wall-mounted TV or simply gazing at the towering trees outside the window. 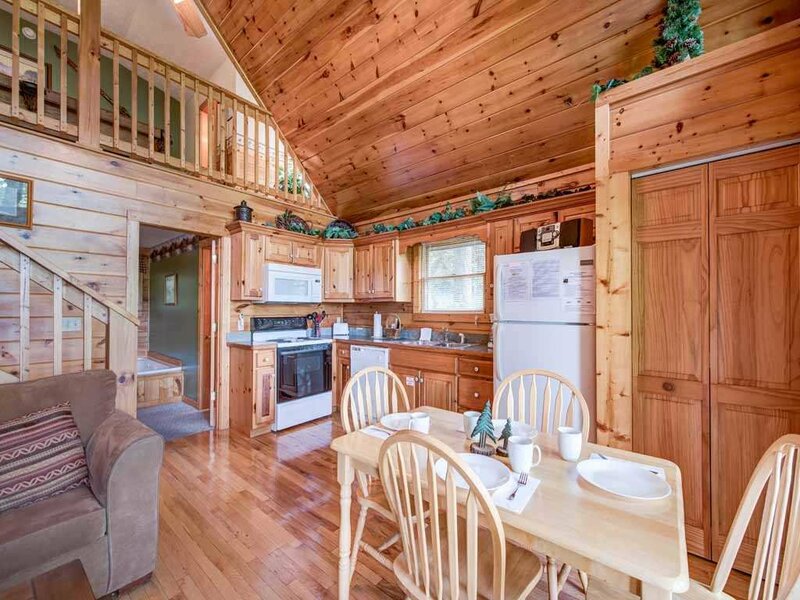 The kitchen and dining area offers amazing views as well. 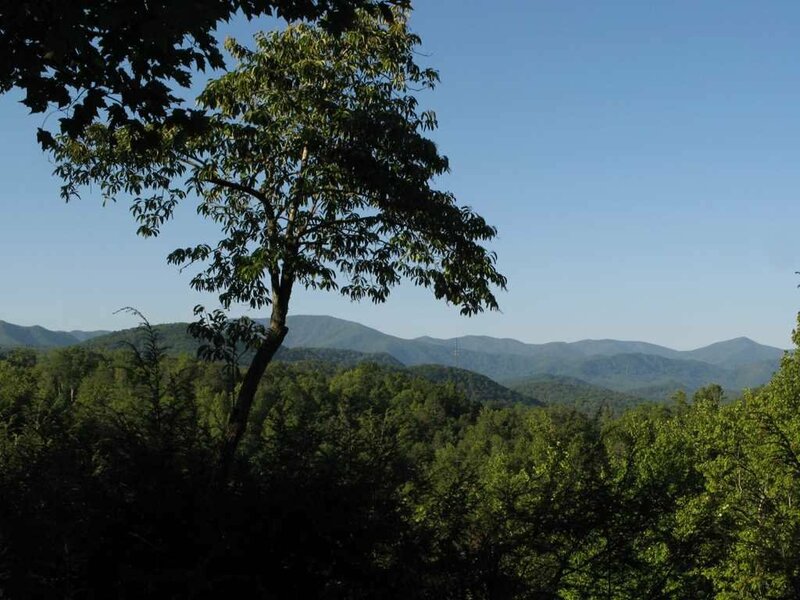 Even the simplest sandwich will taste like haute cuisine when enjoyed at the dining table, which seats 4 and overlooks the front porch and the mountains. 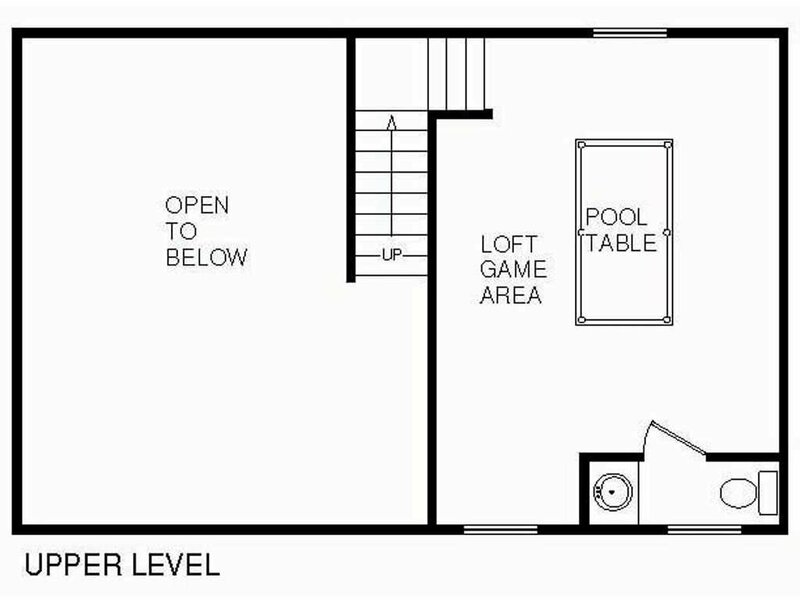 That said, the kitchen is equipped with a full culinary shop’s worth of appliances, cookware, and tableware, so if you want to channel your inner Gordon Ramsey or Alton Brown, you can. 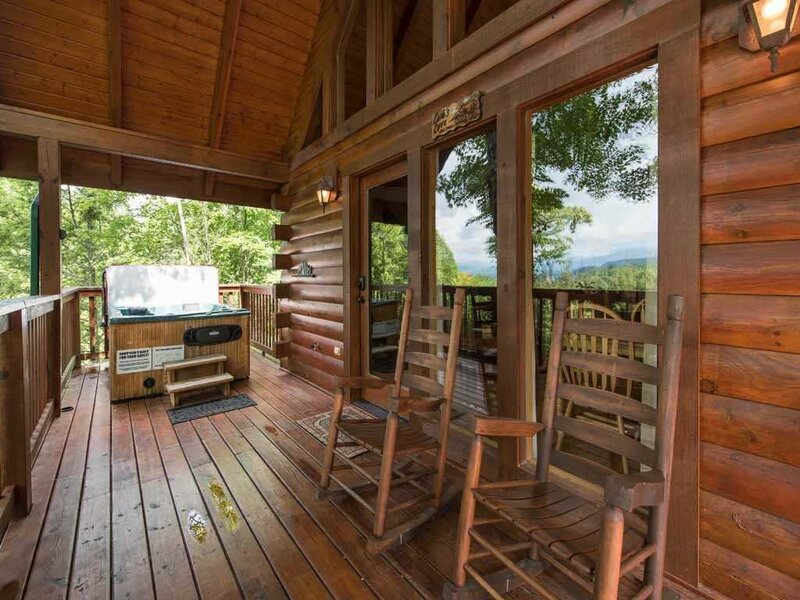 If you’d rather barbecue every night, you’ll love the outdoor charcoal grill. 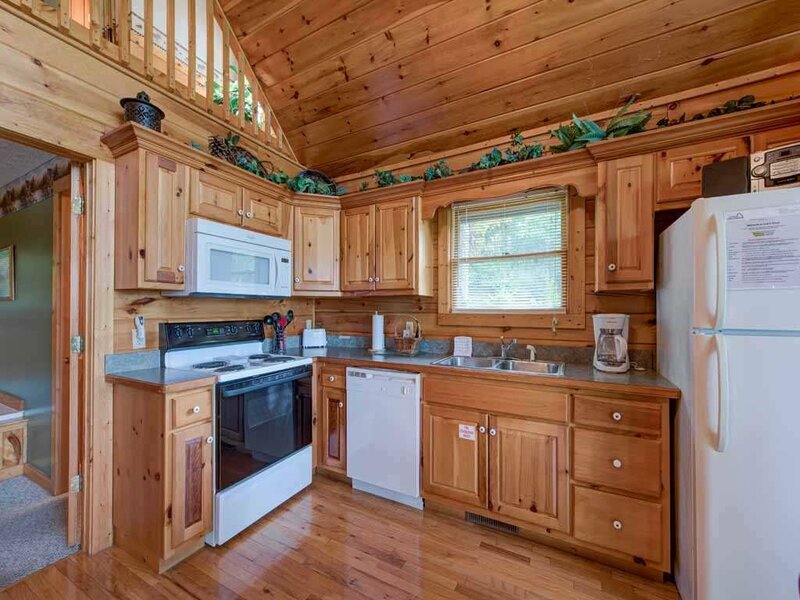 Perhaps best of all: Cub’s Cove even has a dishwasher—no need to waste precious vacation time scrubbing plates! 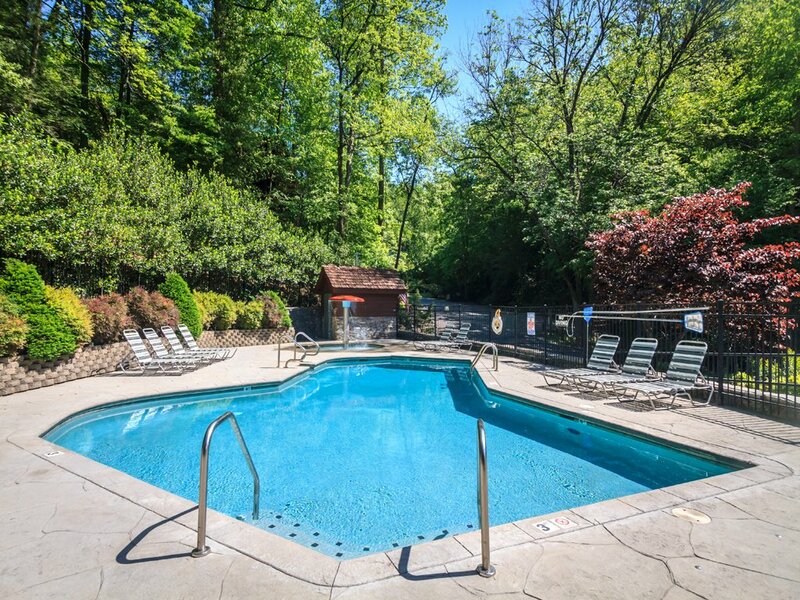 And if your idea of a vacation is not cooking at all, you’re in luck, because Cub’s Cove is only a 5-minute drive from downtown Gatlinburg. 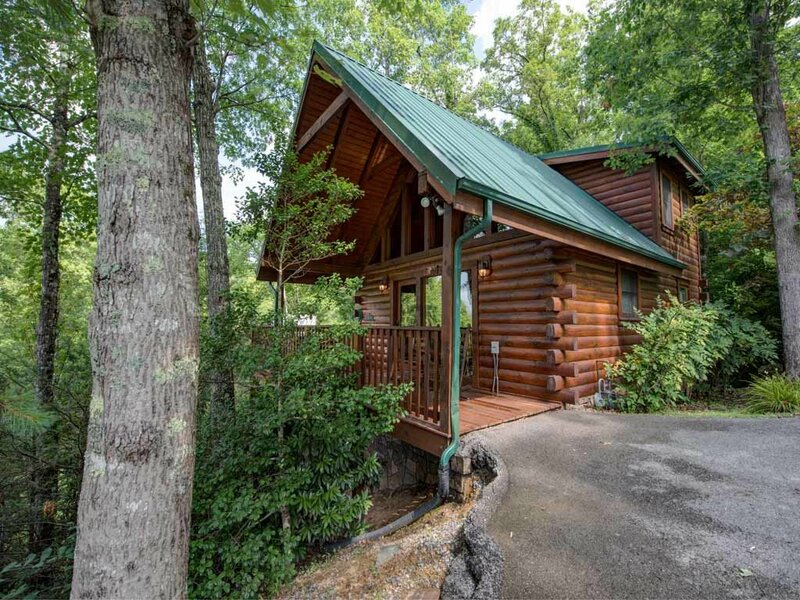 There you can choose from steak, seafood, barbecue, pizza… you’ll even find Tennessee’s first pancake house there, as well as an aquarium, mini golf, and a host of other attractions. 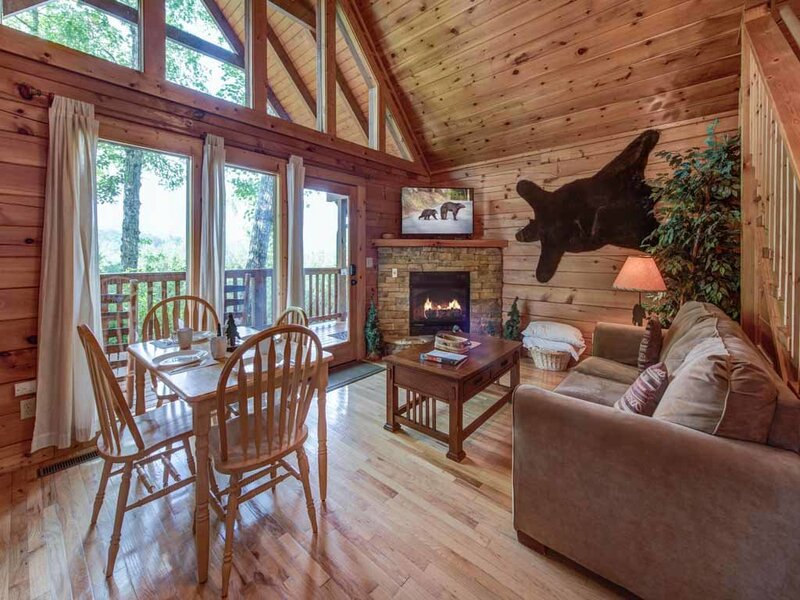 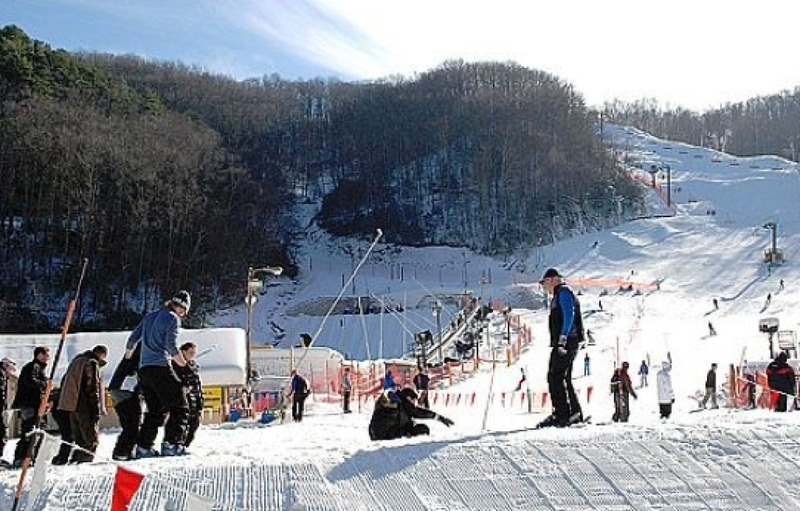 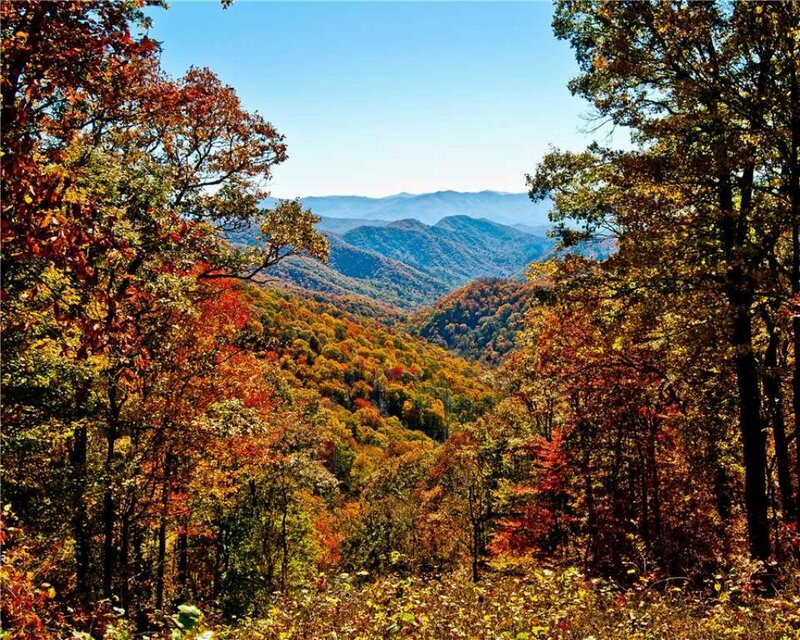 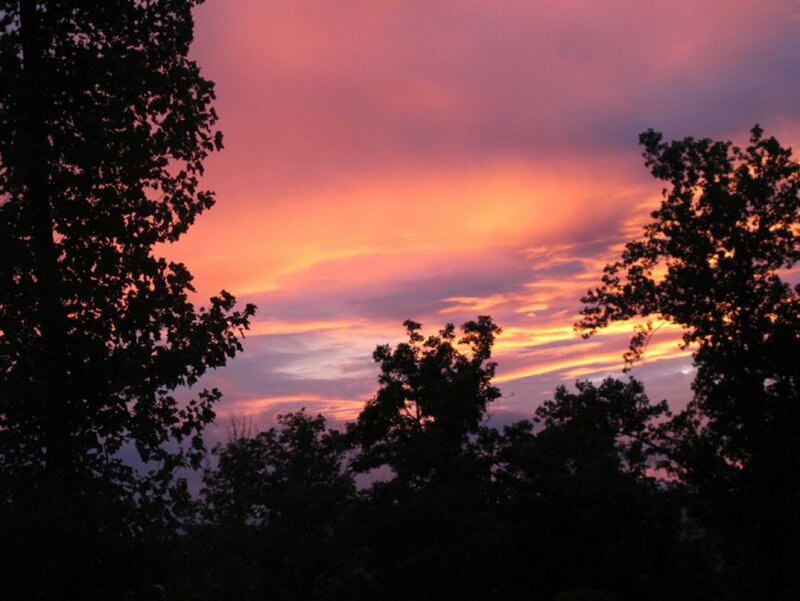 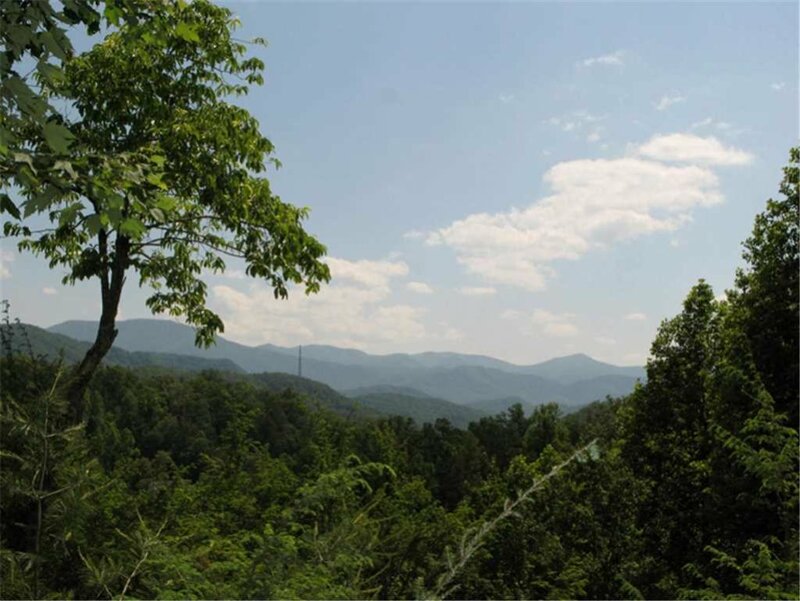 In addition, the cabin is mere minutes from the main entrance to the Great Smoky Mountains National Park, with its hiking trails, historic cabins, waterfalls, and wildlife ranging from black bears to elk. 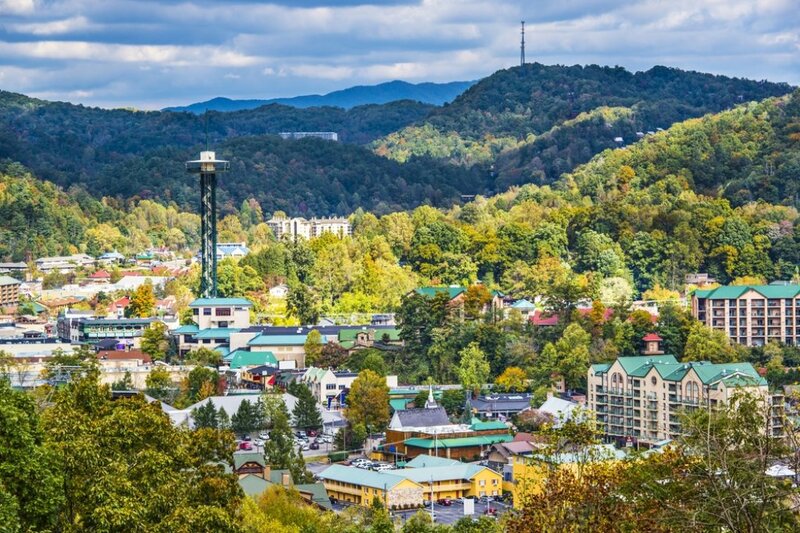 Also conveniently close is the Gatlinburg Arts and Crafts Loop, an 8-mile trail of more than 100 galleries, studios, and craft shops offering everything from stained glass to chainsaw art, custom knives to pottery. 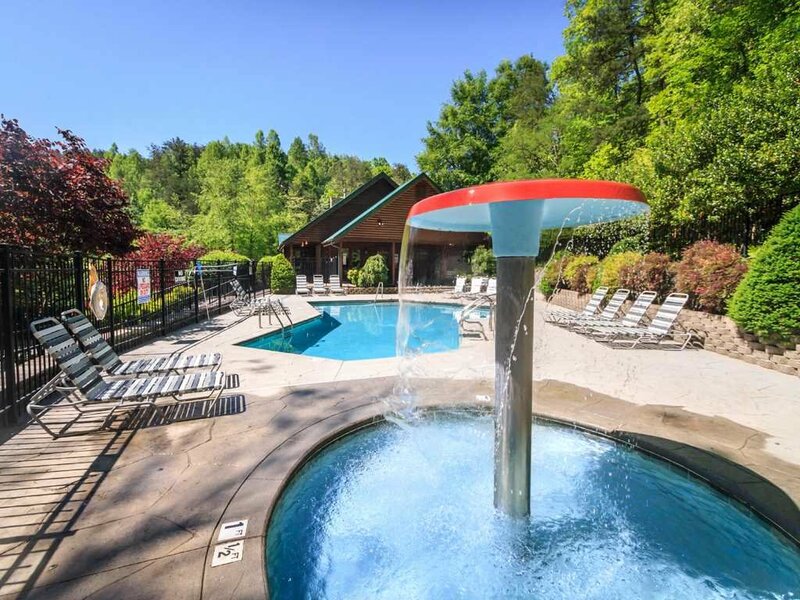 And because Cub’s Cove is part of the Black Bear Falls Log Home Community, in the summer you can take advantage of the resort’s heated adult and kids’ swimming pools. 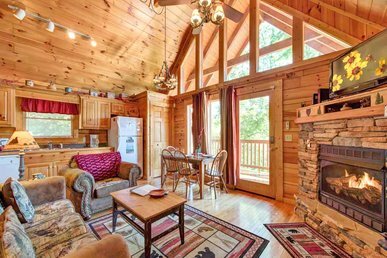 However you plan to spend your days, you’ll relish having delightful Cub’s Cove to return to. 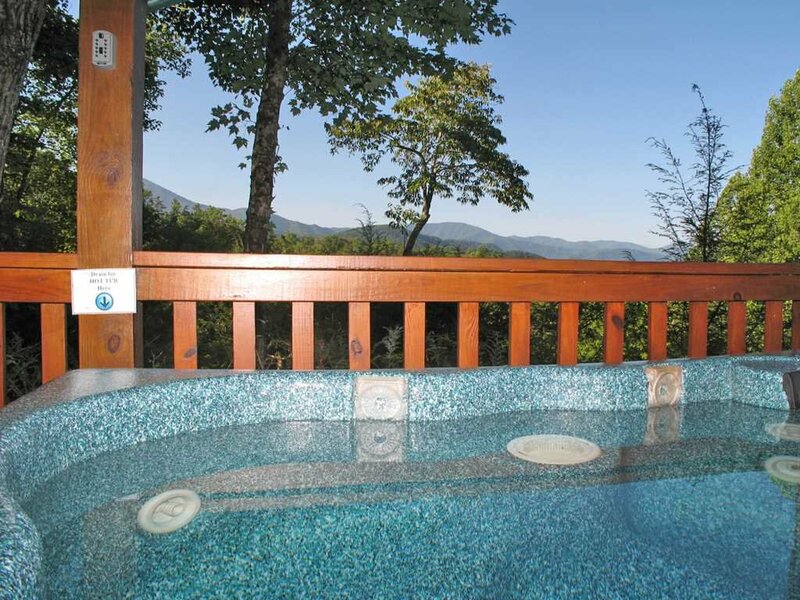 Don’t miss out: Make your reservation today, and start preparing for your best vacation yet! 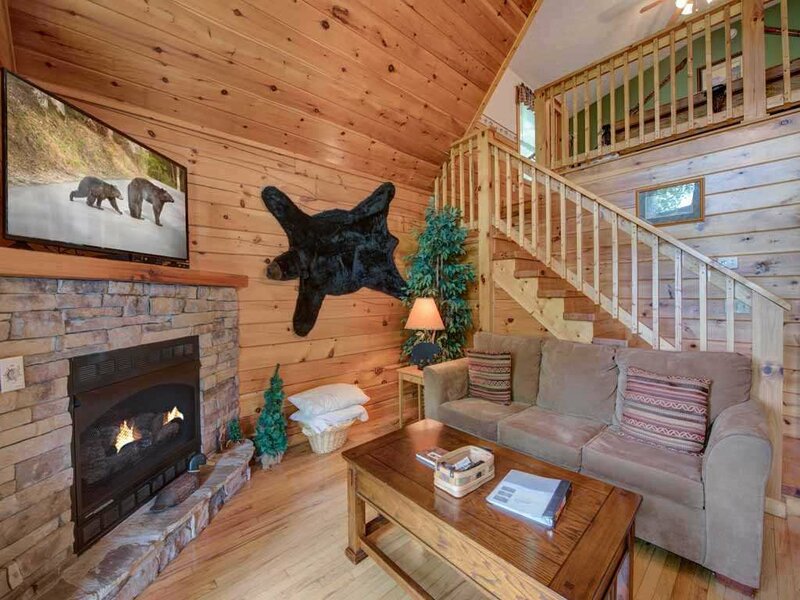 Cubs Cove is the perfect and cutest little cabin! 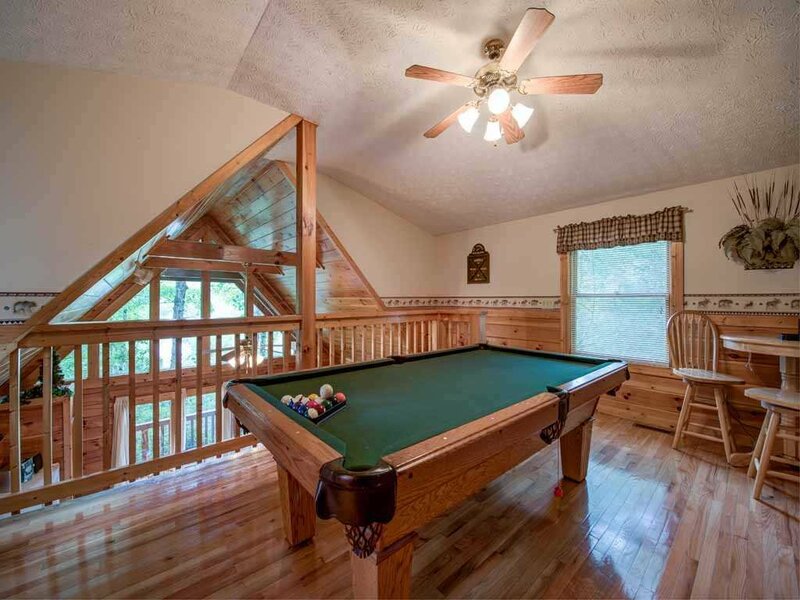 Very clean, has everything you need in the kitchen, the hot tub is great and the pool table was fun!